We’d love your help. 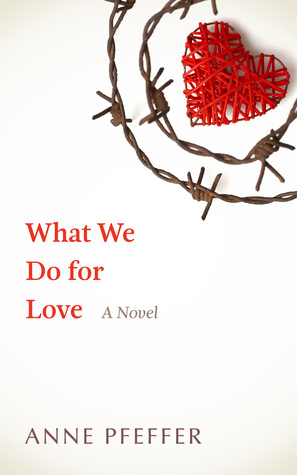 Let us know what’s wrong with this preview of What We Do For Love by Anne Pfeffer. To ask other readers questions about What We Do For Love, please sign up. The author's thanks to the San Francisco Book Review, who gave permission for me to post their review of my book. Please stop me if I start gushing, but this book deserves more than the five stars I am allowed to give it. This book had everything going for it. Lovable, likable characters with morals. A fantastic setting. A realistic storyline. With an even more realistic ending. I mean really, there were no flaws at all in this book and my eyeballs were glued to it the whole time. Nicole is a sin The author's thanks to the San Francisco Book Review, who gave permission for me to post their review of my book. Please stop me if I start gushing, but this book deserves more than the five stars I am allowed to give it. This book had everything going for it. Lovable, likable characters with morals. A fantastic setting. A realistic storyline. With an even more realistic ending. I mean really, there were no flaws at all in this book and my eyeballs were glued to it the whole time. Nicole is a single mom to Justin. Her relationship with his father Brady went downhill when Brady showed his true colors and left Nicole and Justin when Justin was still a baby. Nicole is an artist who specializes in ceramics and is well known for her beautiful glazes. One day, Nicole comes home to find 16-year-old Justin in the kitchen with a classmate of his. A girl. The girl’s name is Daniela. Nicole realizes that something is up with the two teenagers after Justin asks if Daniela can stay the night. She can sleep in his room and he will sleep on the couch. Nicole is very skeptical of this, and rightfully so. For Justin and Daniela have a secret. A secret that will create a “U-turn”, as Nicole describes it, in Nicole’s life. I liked the fact that the author wrote Nicole’s character as a smart Mom who had some very real issues to deal with. She is balancing a working career as an artist with a big piece due with being a Mom to a teenager as well as running a household. On top of this, Nicole’s sister, Caroline, comes to live with her and with Daniela staying at the house as well, Nicole is running out of beds for people. She is resourceful and they create a makeshift bedroom on the covered porch. The whole story was very believable and the characters were not written as sugarcoated, perfect-all-the-time people. I also really liked the complicated but not-so-complicated relationship between Nicole and Mike. Their friendship had endured so much yet they were always there for one another. Mike was like a stepdad to Justin and their relationship was very special as well. My favorite relationship, however, was that between Nicole and Justin. So many things could have gone wrong here. So often, the moms in books are overbearing or clueless or a bit of both. Nicole is smart and is able to read her son so well. They have such a great connection. This could very easily be a true story or made into a movie. The writing kept me interested to the very end. Five shining stars with a cherry on top to What We Do For Love. This was a nice change of pace for me, and a quick read. Thoroughly enjoyed this book. My full review is coming soon! Award-winning novelist Anne Pfeffer grew up in Phoenix, Arizona reading prodigiously, riding horses, and avoiding rattlesnakes and scorpions. After living in Chicago and New York, she escaped back to the land of sunshine in Los Angeles. She has worked in banking and as a pro bono attorney, representing abandoned children in adoption and guardianship proceedings. Anne has a daughter living in New Y Award-winning novelist Anne Pfeffer grew up in Phoenix, Arizona reading prodigiously, riding horses, and avoiding rattlesnakes and scorpions. After living in Chicago and New York, she escaped back to the land of sunshine in Los Angeles. She has worked in banking and as a pro bono attorney, representing abandoned children in adoption and guardianship proceedings. Anne has a daughter living in New York and is the author of four books in the YA/New Adult genres.